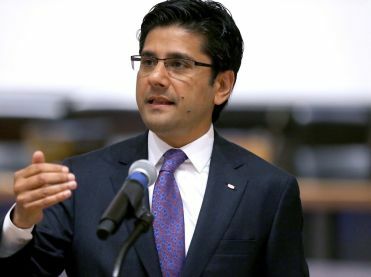 Thirty years after immigrating to Canada at the age of 15, Yasir Naqvi has been named CEO of the Institute for Canadian Citizenship (ICC). Pro-democracy advocates, Yasir’s family emigrated from Pakistan to Canada in 1988. Inspired by his parents, Yasir spent the past 11 years serving as a member of the Legislative Assembly of Ontario, representing a diverse community in Ottawa. In 2016, he was sworn in as the Attorney General of Ontario. Educated at McMaster University, University of Ottawa Faculty of Law, and Carleton University, Yasir was called to the Bar in Ontario in 2001 and went on to practise international trade and administrative law with major law firms. Yasir has marked our idea of citizenship in multiple ways. While Attorney General of Ontario, he implemented the All Families Are Equal Act to ensure that all children are treated equally, regardless of how they are conceived, and recognize the legal status of all parents. He also championed new laws to prevent sexual violence and help survivors, increase respect for the rights and cultures of Indigenous peoples, expand access to restorative justice, and promote multiculturalism. The ICC is Canada’s leading citizenship organization and the world’s foremost voice on citizenship and inclusion. Its national grassroots programs include the Cultural Access Pass, the only program of its kind in the world, and Building Citizenship, which organizes its acclaimed community citizenship ceremonies. Its cutting-edge Ideas & Insights program is redefining how we talk about diversity and belonging. The ICC is the convenor of 6 Degrees, an international conversation on immigration, refugees, diversity, and citizenship. Based in Toronto, 6 Degrees has taken place in cities across Canada, as well as in The Netherlands, Germany, and Switzerland. 6 Degrees now has its European hub in Berlin, will soon be taking place in Mexico City, and will be back in Calgary on March 14, 2019.